3 Goals, 3 Points Clear in 3rd Place : Talking Points. A wonderful morning it is for everyone connected to The Arsenal. The cloud of negativity that hung over the club since the start of the season seems to have vanished completely. Yesterday’s convincing win against Aston Villa was our 7th on the trot in the League. The last time we managed this was when we were winning trophies at will. That gives you an idea of how long it’s been. Granted, Villa were missing Bent and Dunne, arguably their best two players, but the manner in which we went about yesterday’s operation was emphatic to say the least. I won’t bore you with a match report as I’m not really good at those and I’m sure you must have read it somewhere, if you didn’t see the game that is. So let’s look at the talking points. Major positive for me was Theo Walcott. He gave a mature performance, was a nuisance and posed a constant threat. His goal was a joy to watch. A couple of minutes earlier, Song gave him a similar ball, his control was on point but the ball drifted away. On the second attempt though, he controlled perfectly, dropped his shoulder and showed good composure to beat Shay Given at his near post. His celebration showed what the goal meant to him. Another positive was the defensive performance. Koscielny missed out through a minor injury and Djourou came on in his place. People wrote him off before he kicked a ball, and that’s sad to see. Maybe he hasn’t been exactly great in his last few games but this is the same Djourou who was outstanding in 35 odd games for us last season. Our capitulation against Newcastle last season began when he went off injured. So it was good to see him put in a great shift yesterday. He, along with the 3 other men in defence did well. We kept a clean sheet at home, our first in the League in 2012. I was going to single out Arteta for praise, but that wouldn’t be fair. So let’s just commend our midfield trio for yet another virtuoso performance. 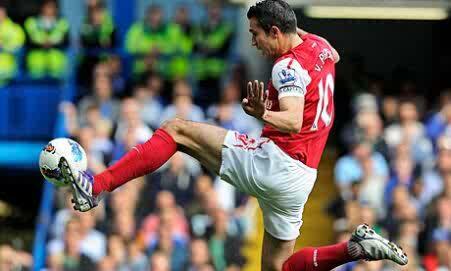 Song got another beautiful assist, Rosicky continued his resurgence, Arteta got a bullet of a goal. Complete midfield performance. Andre Santos returned to the team yesterday, Wilshere and Coquelin are not far off. Our injured players are returning at the perfect and we couldn’t be luckier. Left to me, I wouldn’t bring Wilshere back for this season; except of course one of Song, Arteta, Rosicky picked up a serious injury. Let him rest for Euro 2012, have a good tournament and come raring for next term. No negatives yesterday, Koscielny had tendinitis and he should be fine. 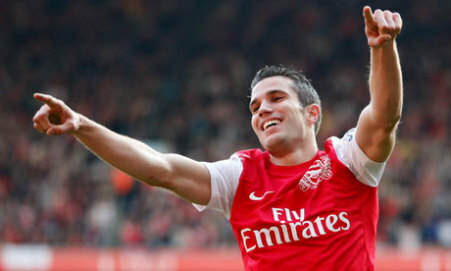 RVP didn’t get a goal for the 4th consecutive half. Worrying times. Nice to see the other players delivery the goods though. All in all, it was a “dynamic” performance, one we needed. One made even sweeter by the failings of our closest rivals. Spuds and Chelski played a boring goalless draw earlier. So the win saw us go 3 points clear, and with a higher goals difference. I’d love to gloat and say we are back, but if this season has taught us anything,it is that things can change very quickly. Have a good day wherever you read this from. Enjoy the win and share in the positivity. QPR up next, another 3 points surely? Reckless at times when coming for the ball, maybe its boredom from never having much to do. Partly at fault for the equalizer as he was caught in no man’s land. Mixed performance, not convincing at all. Gave away a stupid foul, got booked then minutes later got sent off. For a tall CB he’s pretty useless at times, rarely jumps, fails to dominate and at fault for Djouorou’s sending off, thinkihng he was Messi by dribbling out of his own box. Awesome game from the young frenchman, he was strong, fast and aware of all around him. Mr Utility. Very good first half from the welsh captain, got tired in the 2nd half. We need Wilshere back asap ***Just as i type this, Squillaci nods the ball into Zamora’s path and he wins it for them Totally undeserved but we’re to blame. Woeful, poor, silly. I’m so pissed. He should leave for the AFCON already. if he had buried all his chances, the result would be different. He shouldn’t have started, he lacked the usual sharpness and went for goal a couple of times when he should have passed. Came on and we conceded two goals one of which he passed he ball to Zamora with his head. How we lost this game is really beyond me. Oh wait, its not, poor finishing and lack of concentration when it mattered the most killed us. Walcott and Gervinho need to sit down and let other people shine e.g Oxlade and anyone else. What a distasteful way to start the new year. back to the drawing board it is. On a sun kissed afternoon with little to play for but our pride, we delivered a solid performance at the back and in attack. You could blame United’s abject play on fatigue but who cares??? The referee and his assistants did their best to ‘assist’ United but were foiled by a lone goal from Ramsey. The big man was rarely troubled in goal today, and made two big saves in the second half. Let’s end the argument of a new keeper because he’s here to stay. Won all aerial balls he contested and shackled Rooney. Solid all through and confident enough to go on marauding runs on more than one occasion. Not in a long time have I seen so much passion, desire and grit from Clichy. Bar the Fabio opportunity, he gave Nani no joy whatsoever and he assisted in attack when called upon. The young man should have scored two today for his poor finishing. Needs to work on that, asides that, along with Song he shielded the back, got forward when necessary and his interplay with Ramsey in the second 45 was a joy to behold. His start to every game is always so bright and effervescent, had the beating of Evra in the opening stages and put in great crosses. Not his best game in an Arsenal shirt. Wasn’t given as much freedom as he would have liked and picked up an injury which prevented him from appearing for the 2nd half. Played the roles of play maker, target man and shadow marker throughout the game. Dazzling footwork to create the chance for Ramsey who buried it without hesitating. Defended more than he attacked as evidenced by his 4 interceptions and the shot he blocked. Won some tackles as well. Slotted in nicely into the heart of defence and made no mistakes. Came on with the game virtually won. Well there you have it, another twist in the title race and the result for once favours us. If only we had avoided those silly draws, we’ll be closer to the title than the others. Good morning to gooners all over the world, and a special one for those of us who still think we have a shout at the title. Of which that shout was thrown another lifeline last night as a determined Toon Army held Man Utd to a goalless draw, normally I’d be excited but each time United play & drop points before us, we go ahead & do exactly the same. Before the players decide to shoot the clubs bid to end the drought again, the might want to consider who our opponents tonight are. Its the 3rd fixture against our lowly and overly achieving(in the champions league this season) and the reverse league fixture, with the other being in the Carling cup(yeah the same Carling cup in which we were brilliant all the way through & then choked in the final) and I’d rather our players DIE on the pitch than see Sp*ds do a league double over us. We lost the first fixture at home despite going 2 goals up in the first 45 and playing them off the park for 60 minutes only to lose at the death. The last time Sp*ds did a double over Arsenal in the league, dinosaurs were still in existence and we don’t want a repeat of that. Why? Well winning tonight cuts Utd’s lead to four points and keeps us ahead of Chelski just barely though. So unless we want to fight for 3rd place with City, its best we win and keep fighting. Sp*ds are not exactly at the top of the form table and neither are we so there’s a lot to play, our neighbours on the hunt for fourth place, us the title chase and surviving the pack snapping at our heels then throw in the bragging rights part. A draw is not acceptable. To team news, (notice how I haven’t mentioned Fabregas’ interview where he apparently said Wenger would have been fired if he was in Spain, he denied saying it that way but its the truth but we don’t need that now) looks like its going to be the same squad going down the road but maybe not the same lineup & formation. A 4-4-2 won’t be a bad idea, or a 4-2-3-1 with Fabregas beside Song, van persie behind either NB52/Chammy with Wilshere on the bench to give us extra goal threat, but I don’t see AW buckling. Sagna returns to the side after missing out at the weekend. So that’s pretty much it. Our away form has topped our home form this season so hopefully we can win tonight. We’re still keeping the faith not because we’re die hard fans(maybe a little bit) but because we keep getting lifelines, let’s take the initiative tonight and make the title fight one helluva fight. From wherever you’re reading, have a great day. Your thoughts?